Did you get the fasting email? “What are you doing for Lent?” is a common question among Catholics. Since Ash Wednesday is so, like yesterday, maybe we should be praying and growing into a deeper relationship with Christ as we prepare for Easter. Instead of reverting back to the grade-school “I’m going to give up soda for Lent”? Here are some ideas we have of ways to sacrifice, strengthen your relationship with Christ and foster a better prayer life. 1) Pray more – take your prayer more seriously. Set aside the prayer before school and prayer before class and pray. 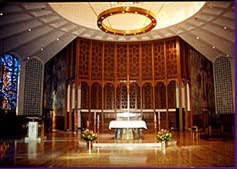 Go to Midday prayer in the Chapel everyday and pray. Really PRAY. 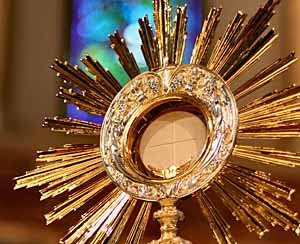 2) Go to Adoration weekly – on Mondays our chapels are set aside specifically for Adoration of the Blessed Sacrament. Just find the time, even for 10 minutes at a time, to go and spend the time with Jesus in this way. 3) Create a good habit – instead of giving something up, try inserting something good into your life this Lent. Are you a pessimist? Try to be more positive. Do you criticize your teachers, parents, siblings, friends a lot? Make an effort to be more encouraging. 4) Pray the Rosary daily – Praying the Rosary daily is a wonderful way to meditate on the mysteries of Christ’s life and to learn more about Mary and how to emulate her piety, humble ways, trust, prayerful life, patience and charity. 5) Go to daily Mass – ok, we know that going to Mass daily is a big sacrifice but it can certainly be done and it is a beautiful way to show God how much you love Him. One of schools has Mass at 7:20 each day. Go first thing in the morning before you start your day. 6) Volunteer – make time to volunteer once a week or at least a few times during Lent. Join Emmaus, CROSS, go to St. Martin's, the INN or just offer somebody help and give of your time. 7) Fast – besides fasting on Ash Wednesday and Good Friday, choose one or two days a week to fast and choose a method that works for you (fasting till noon every day or on certain days, fasting from certain things like sweets). You will constantly be reminded in a physical way to pray. 9) Give up something that you like – truly give up something that you really like, for example a certain drink/food, coffee, television, a website that you waste lots of time on (not this one though! ), etc. 10) Go to Confession – the sacrament of Confession gives us so much grace to help avoid temptation and sin and live the lives that Christ wants us to live. Make it a priority to go to Confession 3 times during Lent. 11) Forgive – is there a person in your life you have been having trouble forgiving? Don’t hold that resentment any longer. Pray about it and ask God to help you forgive. You’ll be amazed at the burden that will be lifted from you. Still in need of some ideas for Lent? "Witness Awakens Vocations” is the title of the Pope’s message for the 47th World Day of Prayer for Vocations that will be celebrated on 25 April – Good Shepherd Sunday – the Fourth Sunday of Easter. "The problem is: surface. I can recite the Rosary daily (and do) , I can read Scripture daily (and do) and got to Mass on Holy Days (and do) and go to Adoration weekly (and do), fast and abstain as required during Lent, but if I’m not working on my interior disposition the results of the exercises are limited.Sure, it’s better than nothing, but I’m aware of my shortcomings. The period of preparation for Lent gave me a greater awareness then suddenly waking up today and realizing it’s Ash Wednesday! My plan is to work on my interior charity; really, the lack thereof. I’m constantly fighting the temptation (well, lets be honest, it’s not a heated battle) to mutter about others, judge people, worry about what other people are, or are not, doing. The minute I find myelf falling into my continual temptation to prove to myself what little charity I really have, I’m going to do one of the following: send up a prayer, seek forgiveness in the Confessional or punish myself by some type of personal deprivation. " This could be the most challenging Lent ever. So, how is your lenten plan going? Giving up anything for Lent? Doing anything positive for lent? Last evening, under the auspices of the Director of Vocations, Bishop Murphy hosted an Operation Andrew at the Immaculate Conception Center in Douglaston. The evening began with the celebration of Mass at the Cathedral Seminary Residence Chapel. Mass was followed by dinner and dialogue. Brother Stephen Michael gave the introductory talk and explained his vocational call to the Marianists. 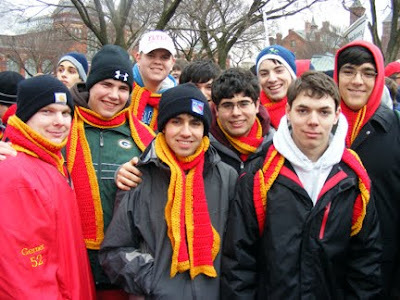 "The life of a Marianist Brother is characterized by being and doing together," said Brother Stephen. "We live together, pray together, eat together, work together, our life is one of Community." He concluded his remarks with "My life as a Marianist is what I was made for!" and the joy he shared with his vocation story said the same. Yahoo sports has a STORY about Sr. Catherine of the Franciscan Sisters of the Renewal, formerly olympic speedskater Kirstin Holum, and her journey from the life of a world-class athlete to religious life. Do you think God may be calling you to serve in the Church? What an amazing reality! Jesus Christ, God in the flesh, gazes at us when we come before Him in adoration! Who in their right mind would not want to be in the gaze of God? During Eucharistic adoration, it is not only we who behold Christ, but it is also He who beholds us. 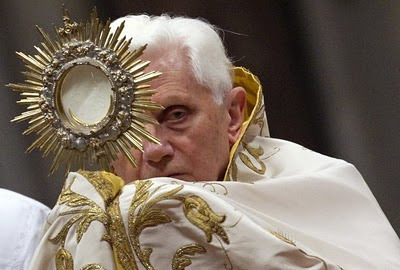 When we adore the Blessed Sacrament, we are not just gazing at a beautiful but inert object. The conteplative mode of prayer that we learn during adoration presupposes that Christ returns our gaze. To find myself in the gaze of the Son of God is very worth it. So if you live near a parish that has Adoration, go. On Mondays our high schools all have adoration in their chapels for extended times. Allow yourself the opportunity to sit in the presence of Jesus and receive the love He desires to pour out into your heart. Try it....you will like it! We all know the annoying ShamWow commercial. Conversion, Repentance, Fasting, Abstaining, Prayer, and Alms Giving... There is a lot to do in just 40 days. 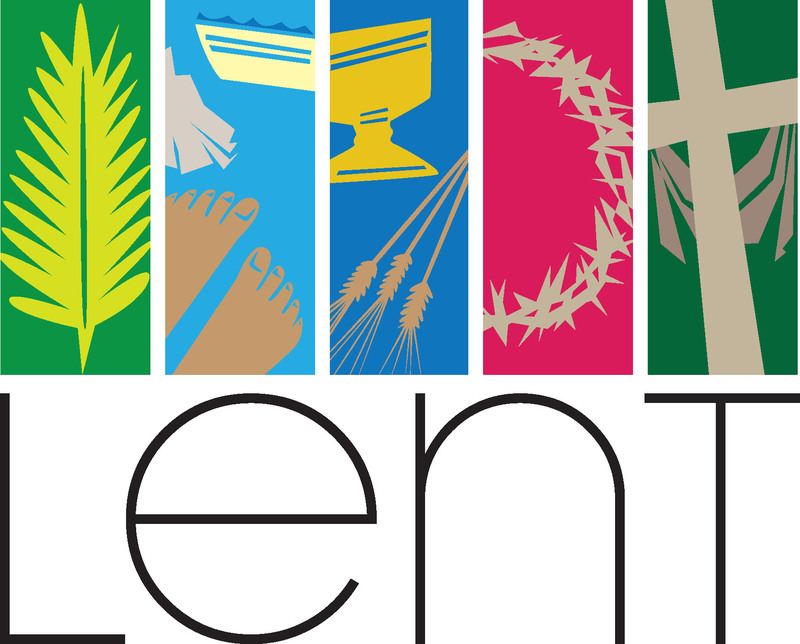 But don't get lost in the "Lenten Lingo", in the end it is all about growing closer and becoming more like Christ! Mass starts at 5:15 pm and the evening concludes at 9:00 pm. Want a few more ideas begin with these five - Heart, Soul, Strength, Mind, and Neighbor. Not much is known about Fra Angelico's early life. We know he was born around 1400 and was named Guido di Pietro. Around 1418 he and his brother Benedetto took vows to become Dominican friars in Fiesole, Italy. Fra Angelico's religious name was Fra Giovanni da Fiesole. 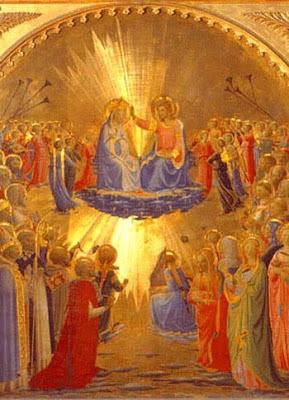 The titles Fra Angelico and Beato Angelico came into use only after his death, as a way of honoring his religious life and work. He began his career as an illuminator of missals and religious books. In 1436 some of the Dominican friars of Fiesole moved to the convent of San Marco in Florence. Angelico painted many frescoes for the cloister, chapter house, and entrances to the 20 cells on the upper corridors. In 1445 Angelico was summoned to Rome by Pope Eugenius IV to paint frescoes for the now destroyed Chapel of the Sacrament in the Vatican. Angelico died in Rome and was buried in the church of S. Maria sopra Minerva, where his tombstone still exists. Fra Giovanni was a simple and most holy man. He became known as Angelico, but he had long been called 'Beato Angelico' (the Blessed Angelico), but his beatification was not made official by the Vatican until 1984. Did you get your ashes today? and to say otherwise wouldn't be the whole truth. a piece of my heart each day? I have trouble with,the heart-parts I hold on to? The rosary is a Christ-centered prayer. It brings us into meditation on the life of Christ. The "Hail Mary" is a prayer﻿ which came from Gabriel, bringing the message from God himself, called her blessed among women. We marvel at God's mercy and greatness, that He would be born of a woman to save us from our wretchedness. We honor her as Christ did, and obey the last words she uttered in scripture, "Do whatever He tells you." Some Catholics are annoyed. Bill Donohue, my friend at the Catholic League, said, "Not only is the pose inappropriate, the timing is offensive: Lent begins next week. Lohan, an ex-Catholic who is spiritually homeless, recently said, 'I’m all about Karma…what goes around comes around.' If she believes that, then it behooves her to apologize to Christians before it’s too late." Gibson, on the other hand, suggests a more generous interpretation: she may be returning to her Catholic roots. If so, it would balance out a departing star: Anne Hathaway just left the church. My take on the Purple cover is that it is a naked (almost) grab for publicity by the magazine and the star, which trades on images that are dear to Christians. And really, does Lindsay Lohan want to be compared to Jesus? In that case, let's take a look at how their records stack up. Consider:Linday made her debut as a child prodigy at age 11 in "The Parent Trap." 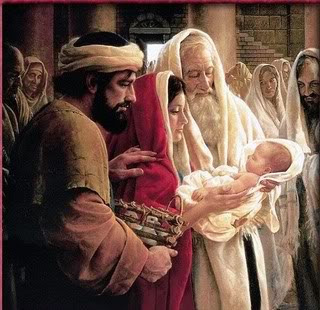 Jesus made his debut at age 12 in the Temple when his parents were looking for him. Lindsay starred in "Confessions of a Teenage Drama Queen." Jesus instituted the Sacrament of Confession, and is the King of Kings. Lindsay is followed by crowds of paparazzi who hang on her every move. Jesus was followed by crowds of people who hung on his every word. Lindsay starred in "Herbie: Fully Loaded," about a car that becomes human. Jesus is God become man. Lindsay was arrested for drunk driving by the Beverly Hills police and was guilty. Jesus was arrested for sedition by the Roman police and was innocent. Lindsay is a "triple threat" in Hollywood: a singer, a dancer and an actor. Jesus is a member of the Holy Trinity. Lindsay has recorded for Universal Music. Jesus is the King of the Universe. Lindsay released a self-tanning product in collaboration with Sephora, and was the face of the Fornarina, an Italian clothing line. Jesus visited the Roman town of Sepphoris in Galilee, and is the face of God. Lindsay refused to comment on politics because she doesn't wish to alienate her fanbase. 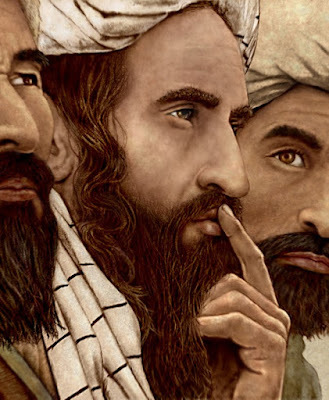 Jesus refused to comment on politics because he didn't wish to endanger his followers. Lindsay worked on a film called "I Know Who Killed Me." Jesus knew who killed him, and forgave them from the Cross. Lindsay dropped out of production of "Poor Things" after being arrested for drunk driving. Jesus was poor, and was arrested after drinking with his friends at the Last Supper. Lindsay posed in Purple for a fashion shoot, which would help sales. Jesus was clothed in purple before his crucifixion, which would redeem humankind. Lindsay will star in a movie called "The Other Side," hoping for a comeback. Jesus died, went to the Other Side and had a big comeback, too: Easter. Life lesson for Lindsay: Be careful who you imitate, lest you suffer by comparison. For the glory of the Most Holy Trinity, the honor or Mary, and to follow Christ more closely, I vow to observe chastity, poverty and obedience conformably to the Rule of Life of the Society of Mary. places through the Immaculate Virgin Mary. You do the Math, but the years of consecration to the Church is over 180 years! May He who began this good work, bring it to completion! Oh ever immaculate Virgin, Mother of Mercy, Health of the Sick, Refuge of Sinners, Comfortess of the Afflicted, you know our wants, our troubles, our sufferings. Look upon us with mercy. When you appeared in the grotto of Lourdes, you made it a privileged sanctuary where you dispense your favors, and where many sufferers have obtained the cure of their infirmities, both spiritual and corporal. We come, therefore, with unbounded confidence to implore your maternal intercession. Our loving Mother, obtain our request. We will try to imitate your virtues so that we may one day share your company and bless you in eternity. Amen. The key element in this story about Jesus and the leper is that Jesus reached out and touched the leper. By doing that, Jesus broke a multitude of social and religious mores. Lepers were outcasts. To touch a leper made one socially and religiously unclean. It was thought at that time that to touch a leper put your life at risk. Jesus went against the conventional wisdom of the day, and broke the rules. He reached out and touched the leper and when he did so, he communicated awareness, acceptance, love, and a power that produced health. We appreciate and desire touch in our lives. We like to hold hands, to receive a hug at the appropriate time, or to have a pat on the back. There are times, however, when we avoid touch. We avoid touch when we hurt. There are times when we have the flu or other illness that we don’t want anyone touching us because it hurts. We also avoid touch of reality because we fear it would be too painful. · We don’t allow others to touch us as a defensive mechanism. We don’t want others to get too close to us, or they might discover some things about us that we don’t want them to. Even, we don’t even want to get to close to ourselves, because we don’t want to know the harsh reality of our condition. · We don’t allow others to touch us because we are angry at them. How often we have said, “Don’t touch me! I don’t like what you said, or what you did.”We avoid touch at the very time we need desperately to be touched. How comforting it is in the midst of our sickness to feel the gentle caress of a hand. As much as we don’t want to be known, we crave touch and to be known intimately. Even in our anger we desire the touch of reconciliation. The text today invites us to follow the lead of the leper, and ask Jesus to touch our lives. Like the leper, when we ask God if God wills to heal us, God always replies in the affirmative. We are invited to enter into God’s presence and open ourselves up to a loving God. In God’s presence we are able to confess our hurt, lower our defenses, and release our anger. This passage of scripture invites us to open ourselves to God’s healing touch in our lives, wherever that healing touch is needed. So brothers, Jesus invites us to come to him now in prayer, and share with him our need to be healed. Like the leper whom Jesus healed, so Jesus will say “Yes,” to us, and we touch our lives in ways we have never been touched before. Today's blog is a reflection given several weeks ago by one of our Marianist Brothers from Togo. The Holy Father's homily for Vespers on the Feast of the Presentation of the Lord is, as are all his homilies, a model of liturgical preaching. Below is shared a small excerpt of the Holy Father's message. Consecrated men and women, be they hidden in the cloister, or engaged in the Church's mission to the world, are associated to the Lord Jesus and called, at every moment, to remain close to Him, at "the throne of grace." If Christ was not truly God, and was not, at the same time, fully man, the foundation of Christian life as such would come to naught, and in an altogether particular way, the foundation of every Christian consecration of man and woman would come to naught. Consecrated life, in fact, witnesses and expresses in a "powerful" way the reciprocal seeking of God and man, the love that attracts them to one another. The consecrated person, by the very fact of his or her being, represents something like a "bridge" to God for all those he or she meets -- a call, a return. And all this by virtue of the mediation of Jesus Christ, the Father's Consecrated One. He is the foundation! He who shared our frailty so that we could participate in his divine nature. Our text insists on more than on faith, but rather on "trust" with which we can approach the "throne of grace," from the moment that our high priest was himself "put to the test in everything like us." We can approach to "receive mercy," "find grace," and "to be helped in the opportune moment." It seems to me that these words contain a great truth and also a great comfort for us who have received the gift and commitment of a special consecration in the Church. Here is a little piece from a doctoral student at Syracuse University. Hope you enjoy it! I suspect we all want to maintain a certain psychic integrity, to think well of ourselves and to present an image to other people that we want them to think about us. It’s easy enough to pooh-pooh the obviously superficial stuff as a way of cobbling together an identity – how expensive your clothes are, how perfect your body is, so on. Jesus goes further, though, to root out any places where our egos try to hide: even ostensibly good stuff like getting an education, being religious, can be one more way of convincing ourselves that we have got it together. In fact, it’s insidious, because although I believe religion can be the best thing in the world, it can also be the worst thing when it gives divine legitimacy to inflating our egos. "Who you truly are is who you are in God and nothing more..."
Today's Gospel reading is amazing! There was a time when crowds of people would gather around the Lord to hear Him speak the very words of God. Jesus is being crowded out. Closer and closer to the water’s edge He is pushed, so He gets in the boat to teach the people. He needs His space! Eager listeners were so hungry for the words Jesus spoke, they couldn’t get close enough to Him! We’ve lost that passion for the words of God. Peter retorts with a: been there, done that. What “But Lord’s” are you speaking today? Tired and weary Peter, already up all night long from working and fishing, yet catching nothing, had put his nets away. 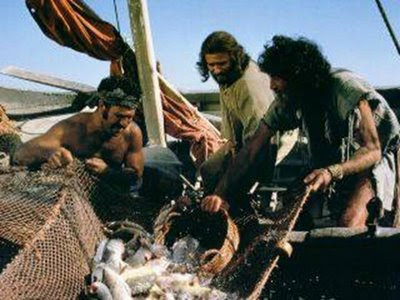 Jesus says, ‘Go out deeper, and let your nets down again’. Let’s listen to God’s Word and then do as Peter did: “But because you say so…I’ll obey.” Move out to the deep waters in faith, gather his rewards, share it with friends, then fall at the Lord’s feet at the love He has for us and the care He has for our daily tasks. If you have not heard, the Dominican Sisters of Mary, Mother of the Eucharist in Ann Arbor MI will be featured on the mega-popular Oprah Winfrey show on February 9th – the 13th anniversary of this new Dominican community of religious sisters. The Sisters have visited our schools and will visit again this year. They will host a women's retreat in late February. What is really misleading is Allred’s duplicity. Several years ago, she represented Amber Frey in a case related to the death of Laci Peterson; Peterson’s husband, Scott, was convicted of murdering both her and the baby she was carrying, a boy they named Connor. In an interview she gave to Hannity and Colmes on the Fox News Channel on June 5, 2003, Allred found it useful to her case to emphasize the humanness of Peterson’s baby: “And the fact that there are two individuals who are dead there, Laci and Connor, that has to be the most important consideration of everything.” For once, she was right. God is great...all the time! All the time...God is good! We are tiny and God is great, all powerful, all sovereign and all good. Saint Blaise devoted the earlier years of his life to the study of philosophy, and later became a physician. In the practice of his profession he saw so much of the miseries of life and the shallowness of worldly pleasures, that he resolved to spend the rest of his days in the service of God. From being a healer of bodily ailments he became a physician of souls. When appointed bishop, Saint Blaise, began to instruct his people by example. From all parts, the people came flocking to him for the cure of bodily and spiritual ills. When the governor began a persecution by order of the Emperor, Saint Blaise was seized. After interrogation and a severe scourging, he was hurried off to prison. While he was under custody, a distraught mother, whose only child was dying of a throat disease, threw herself at his feet and implored his intercession. Touched at her grief, he offered up his prayers, and the child was cured. you willingly bore heavy crosses in faithful imitation of Jesus. Similarly, with Christlike compassion you cured many sufferers. you died as a martyr for Christ. Obtain a cure for these ills if this is agreeable to God. Amen. 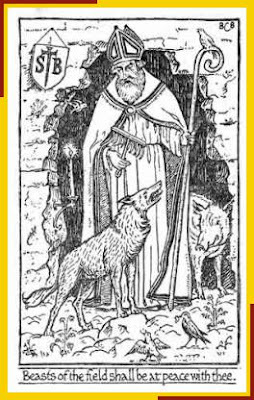 Blaise is the patron saint of wild animals because of his care for them. Forty days after Christ's birth the Law of Moses required Mary to go to the temple and take part in the ritual for purification. This was also the day Mary and Joseph formally introduced Jesus to the House of God. In 1997 Pope John Paul the Great also made February 2nd the World Day for Consecrated Life. This day focuses on members of secular institutes, movements and personal prelatures, as well as members of Societies of Apostolic life. These people have taken vows and effectively set themselves apart for God, that He may use them to do His will in the world and in the Church. 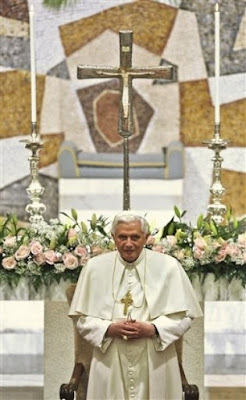 Every year Pope Benedict celebrates the Feast of the Presentation of the Lord with the members of Congregation for Institutes of Consecrated Life and Societies of Apostolic Life to remind us that just as Mary and Joseph presented Jesus to the Lord, those who are consecrated have also presented themselves to the Lord. This day serves as a day for them to once again re-affirm their response to God’s call t o set themselves apart for His will. The Marianists of the Province of Meribah celebrate today their witness of Christ. With great joy the Brothers express that the Lord is the Love who is able to fill the heart of the human person. We consider today the words of John Paul II: "Truly there is great urgency that the consecrated life show itself ever more "full of joy and of the Holy Spirit," that it forge ahead dynamically in the paths of mission, that it be backed up by the strength of lived witness, because "modern man listens more willingly to witnesses than to teachers, and if he does listen to teachers, it is because they are witnesses"
One of the repeating themes of our junior retreat program is: Do you know who you are? No, really! Do you know who you are? Do you know your strengths and weaknesses? Do your know some of your virtues and some of your vices? The companion question is: Do you know WHOSE you are? This question struck me on our last retreat. Do I know WHOSE I am? I know the answer. I know I belong to God. I know I am the son of the Father. At least in my head I do. But what about my heart? Do I live like I know I am His beloved son? Do I know I am a child of God?It is a good question. Do I have an idea that I have a Father who loves me? I am sure in my heart I know whose son I really am. Do I know in my heart who my true Father is? Yes, I know. Today I know. I can forget sometimes when my childhood memories threaten my peace of mind. But even when I am deep in the pit, I can sense, deep down inside ... a presence ... a peace ... that cannot be denied. But just in case I was wavering on that answer too much, the Lord made sure I got the message. When I came home from the retreat, I caught up on some of my email and visited some of the blogs I follow. One of them was entitled, You're Mine. You say I belong to You? Even when I neglect You? ignore You? Think just maybe I may be in control? You still want me? Love me? I am not just some nameless object You created and check in on from time to time. You want a personal, moment by moment relationship with me. I don’t understand You at all, Lord. But thank You for knowing me, for naming me, for claiming me as Your own.